Animals are everywhere in our lives: as pets, livestock, and workers. The argument could be made, however, that they were more important to the peoples of ancient Greece and Rome. A remarkable number of objects in the Kelsey Museum somehow relate to animals. These range from representations of familiar fish to mythical beasts, from dog paw prints to a camel harness, from toy horses to the famed "owl" coins in Athens. Students at the University of Michigan enrolled in the course Food in the Ancient World (offered through the Department of Classical Studies and taught by Professor Sue Alcock) used all these artifacts to explore and present different aspects of animals in antiquity: animals as food, as laborers, as entertainment, as pets, as sacrificial victims, as symbols of power and terror. The subject for the exhibition arose naturally from the "food-oriented" theme of the course. Yet it has appeal for other reasons as well. School groups and families rank among the principal audiences of the Kelsey Museum, and animals are an obvious and natural favorite. But animals are good for more than fun! Studying them reveals a great deal about daily life in the ancient world (what would farming be like without tractors? how much meat might people eat a week? ), about ancient religion (why did Greek and Roman gods demand animal sacrifice? ), and about political power (as a Roman emperor, why might you put an animal on your coinage? and which one?). 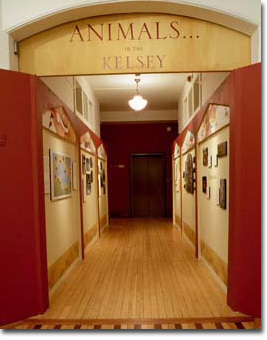 One other feature of the exhibit will literally highlight animals "in the Kelsey." Over the course of the Museum's history and numerous field activities, animals have been involved as everything from "dig dogs" to beasts of burden. Web site created by CHICO , which is based at the University of Michigan, School of Information. Please send your comments and questions to CHICO.